Avalonia is a name applied to rocks with distinctive Early Paleozoic "Atlantic" faunas that are found in scattered locations along the North American East Coast. These rocks were intensely puzzling to paleontologists in pre-plate tectonics days. The fossils resembled those of England and parts of Africa far more closely than they did "Pacific fauna" fossils of the same age found in Vermont, Western Massachusetts and Northwestern Newfoundland. The Pacific Faunas were virtually identical to those in the Rocky Mountain and Great Basin areas. The Avalon, Carolina, and Bras d'or Terranes are rocks associated with a long narrow slice of continental material that broke loose from the continent of Gondwana sometime between 700 and 500 million years ago. This "micro-continent" called Avalonia then drifted away from Gondwana (Africa/South America); crossed the Iapetus Sea; collided with another small continental fragment called Baltica; and finally collided with Laurentia (North America) around 400 million years ago. It was further squeezed and deformed when the Rheas Sea between Avalonia and Gondwana closed around 300 million years ago. And finally, the Avalonian rocks were separated into two groups about 200 million years ago when the modern Atlantic Ocean opened. One part is found in portions of extreme Eastern North America from Newfoundland to the Carolinas. The other part appears in parts of Europe -- most notably England and Wales. Other Avalonian rocks are found on both sides of the Straits of Gibraltar. It is known that Avalonia itself consists of parts of several older Terranes that were affixed to Gondwana before metazoan life arose on Earth. Recognizable Avalonian sediments consist of volcanic rocks and late Proterozoic and early Paleozoic marine sediments. They are overlain in places by Middle Paleozoic marine and continental sediments and by Upper Paleozoic and early Mesozoic continental sediments. In the US and Canada, they are found in Southeastern Newfoundland, Northern Nova Scotia, Eastern New Brunswick, Coastal Maine, and Eastern Massachusetts and Rhode Island. A second set of poorly studied outcrops occurs in Virginia and the Carolinas East of the Appalachians called the Carolina Terrane is generally thought to be a Southern extension of Avalonia. Late Pre-Cambrian and Cambrian volcanics in Western Cape Breton Island have been identified as separate a Bras d'Or Terrane, that may have travelled separately from Avalonia along more or less the same path. However other authors feel that it is part of the adjacent Avalon Terrane. I have been unable to identify any fossil localities associated with the Bras d'or terrane. The rock sequences in US/Canada Avalonia are sufficiently different in various outcrops that most Geologists and Paleontologists who have studied them prefer to use different nomenclatures in different areas. 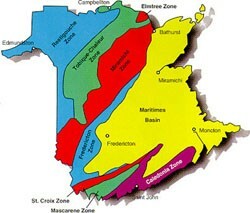 For the most part, they see four regions -- One in the Canadian Maritimes. Another in coastal Maine. Another in Eastern Massachusetts and Rhode Island. And a fourth in the Carolina Terrane. Avalonian rocks are exposed in South Eastern Newfoundland, Northwestern Nova Scotia, and Eastern New Brunswick. The following includes a number of recognized formations. Others have been identified that may fit into gaps in this sequence or may be alternate facies/names for the formations identified here. These are Silurian Rocks found in Coastal Maine and Southern New Brunswick. They presumably differ somewhat from Avalonian rocks of the same age found in Nova Scotia. Avalonian rocks in the Boston and Naragansett Basins consist of scattered outcrops of Cambrian rocks East of Boston and Providence. Devonian lakebed and marine sediments are found Northeast of Boston. Non-fossiliferous Carboniferous rocks are found around Boston. They are capped with a thick sequence of Pennsylvanian continental deposits with plant fossils and low grade coals in Rhode Island and adjacent Massachusetts. Carboniferous and later rocks are addressed in the discussion of the Maritime Cover Terrane. Extends from South Central Virginia to Georgia in a band East of the Appalachian front. As might be expected, it is the most outboard (Easterly) of the terranes present in the Piedmont region between the Appalachians and the flat Atlantic coastal plain composed of Cretaceous and Tertiary sediments. The "Carolina Slate Belt" is the largest part of the Carolina Terrane but other slices East and South of the Carolina Slate Belt are also considered to be part of the Carolina Terrane. I have been unable to identify much in the way of fossil sites or paleontological study in the Carolina Terrane. It is unclear whether this is due to poor exposure, lack of fossils, lack of study, or several of the above. It appears that what few fossils have been found are quite old. It is possible that no fossils younger than Middle Cambrian exist in the Carolina Terrane. A handful of Ediacarian fossils have been found in Stanly County NC. An Avalonian Middle Cambrian trilobite fauna is found at a Quarry near Batesburg, SC. "Atlantic Fauna" trilobites have been found in the "Grandfather Mountain Window" where Laurentian rocks have eroded away exposing rocks that were originally thrust under the Laurentian rocks. However, it appears that the rocks exposed in the Grandfather Mountain Window are part of a more westerly slice that lay between the Carolina Terrane and Laurentia. No recommended localities. Silurian locations along the coast near Araseig, NS seem to be popular. Collecting of loose material on the beach there is currently permitted. Collecting may be possible at some Cambrian sites in Newfoundland and New Brunswick. There appear to be numerous Silurian localities in NorthEast Maine between Machias and Eastport -- access is unknown. Devonian Ostracods used to be extremely common at sites in Rowley, MA, but only the one genus of fairly uninteresting arthropod occurs there. Some sites in Eastern New England are open to collecting, but the material except in extreme Northeast Maine is said to be sparse and often poorly preserved. They are probably best suited for local collectors who can research access and collecting rules.